DD took a domino and created an addition problem writing it on her recording sheet. 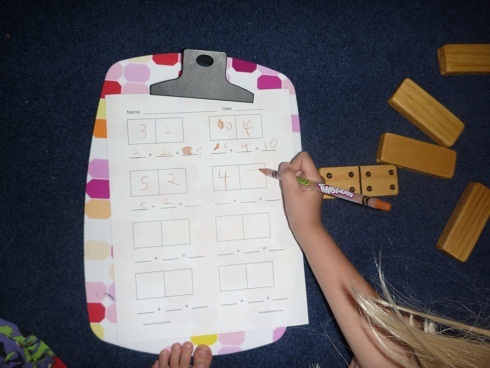 We used the domino recording sheet from Mathwire. 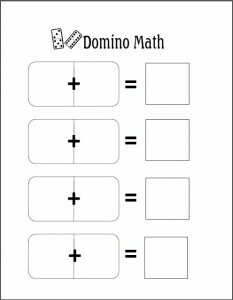 You can find more domino math ideas on the investigating dominoes page and on this Mathwire page.There’s a cute activity also for addition called the domino parking lot with use with regular sized dominoes. 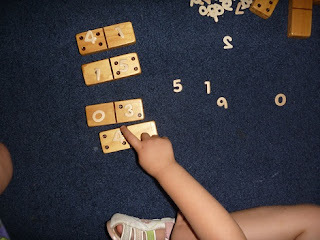 ED simply counted the dots and put her wooden numbers on top of each side of the domino. I changed the addition sign to multiplication for LD. 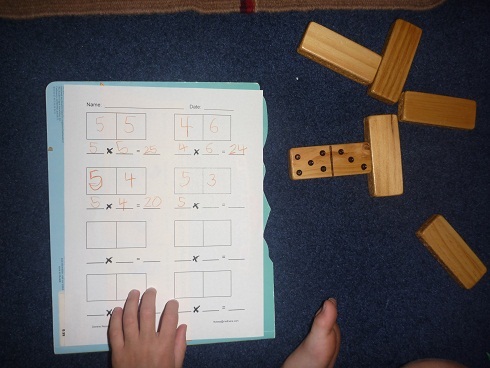 You can extend these activities by printing out the double-nine domino set from Mathwire. P.S. Update: The next year, I needed a domino page for ED when she was working on addition. Where did you get those nice wooden numbers? These are great activities from Mathwire. Thank you for reminding me of them.